T3: VR technology is red hot right now, with Microsoft, HTC, Razer and more unveiling hardware, prices and launch dates. What's your take on the technology and does any device stand out? 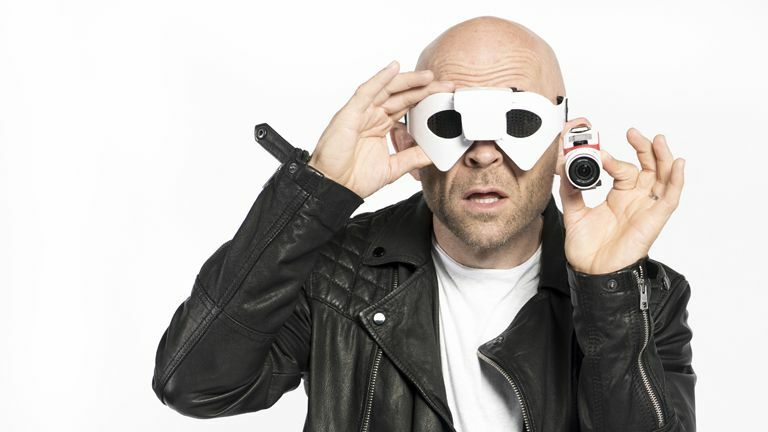 Jason Bradbury: Well you guys really know your stuff on T3, so you won't be surprised to hear that the HTC Vive stands out. I think that is because of its augmented dimension, it doesn't just offer virtual immersion as its front-facing camera can augment your environment. In terms of the general VR field, I think that the ecosystem that any VR device sits in is as important as the hardware itself. Oculus has always been a little bit complex and a bit figidity to get working , and I don't think that is going to change even when they go to market. I also think that mobile devices are becoming more powerful and most marketeers would get behind the idea that within the next 18 months there is going to be a quantum shift in the sense that most people on the planet will be accessing the Internet via mobile devices. It's not the case right now but it is about to change. This is shown out in facts like that Internet advertising is about to overtake TV advertising - there is a huge shift toward mobile. So a VR device that can plug into a mobile device and work really easily will give people the freedom to explore VR in a more interesting way. This is especially true for AR as well, augmenting activities like fitness running as the Recon Jet does. And remember that while Recon Jet is a stand alone device, it does rely on your phone for your social media, txt messages and playlists to come up on screen. It is a really good example of a well-integrated use of AR. I played Alien: Isolation on the Oculus and that was one of the best gaming experiences of my entire life. It's so immersive VR when it works like that. With 3D audio too! Man, my spine is tingling just thinking about it! I mean, can you imagine a Star Wars game! Imagine flying down the Death Star trench in VR and been able to look all around! T3: Speaking of which, what games or gaming tech is currently turning you on? Are there any titles you are specifically looking forward to this year? JB: The game I am most enjoying at the moment is Star Wars: Battlefront. Not since the days of Counter Strike or very early Call of Duty games have I spent so much quality time in a game. I'm also allowing, although I probably shouldn't be, my 8 year old boy to join me in the battle. I actually went and bought a second Xbox and set up a separate account and we sit side by side at the weekends. I only allow my kids to game on the weekends because it is too much of a black hole for their attentions during the week. Just spectacular! It's like gaming crack that game. I've also been playing Guitar Hero Live on PS4, which I really like too. T3: Wearables are also super hot right now. Would you agree in saying that we have now reached peak wearable? JB: I agree with you. Well, look, you've got all these parameters like steps, calories, floors, sleeping patterns right? And therein lies your problem. Those things, as metrics, have been pulled left, right and centre. And where we are now is the result of that. What we need to do to progress is to aquire more data as those algorithms need to progress. We need different sensors, a different biological input. So I feel that we are going to stay in this hiatus, on this wearables plateau, until a new piece of tech is created. Something comparable to what accelerometers did for a multitude of tech areas. It could be something like, for example, a sensor that tracks glucose blood sugar levels or how much oxygen per blood cell. A new parameter is required and until then we'll stay where we are with just a novel layer of interest. T3: If I was to hold a gun to your head and ask you to choose one wearable to use what would it be? JB: Oh it would have to be the Recon Jet. I love it! I use it all the time. I use it as a cyclist as it gives me more information about the ride and also lets me read tweets while I am cycling. T3: What's hot at the Gadget Show Live this year? JB: Well, the British Inventors Project is happening and I get the honour of being one of the judges. I love it and I'll tell you why. I think that we're talking about the future. I think that if anything is positive and exciting then it's our collective future, because the one thing that I think we are really good at in this country is inventing things. We're really good at designing and creating things. In a way we've moved our industry away to China and India, but what we've kept is our mental agility. This is interesting, as I argue that we shouldn't be teaching our kids to code, and the reason I say that is that in the future computers will do our coding for us. What we'll need to be is imagineers. And that's exciting. By the way I don't think we should be doing STEM for kids but STEAM, adding in art into science, technology, engineering and maths. The reason I say that is that we've always been creative pioneers in Britain. You know they say that Britain is the financial capital of Europe, well it is also the design capital too. For example, all the big architectural firms have offices here, all the big design agencies and fashion houses too. And that is really exciting. That's where we are headed. It's all about ideas! So getting back to the inventors competition, that is why I think it is so important. And the things shown off never fail to impress me. As a judge what I will be looking for is something that defines a new market, something that addresses a genuine problem. And again, we're back to VR aren't we? As isn't that why we are all talking about it and have been for 18 months. It's because it's new isn't it! Actually, properly new! Isn't it amazing that something genuinely new has come along. It's a properly immersive experience that feels different. That's the thing I'll be looking for at Gadget Show Live, something new or completely unexpected. T3: If we should be encouraging children to be imaginative, what sort of things should we be implementing in schools to facilitate creativity? JB: I think we need to invest in slightly different educational technologies and I also think we need to take art more seriously. I mean I studied art at A-level at Lincoln Art College and my daughter has an art tutor that she visits every Sunday and has done for 3 years. And that's important as it teaches her to think in abstract terms. She's only 10 but one day she might make a papiermache light of her initials, which has LEDs stuck in it - so she's not sitting there gazing at a still life, she's thinking in abstract terms. I think that abstract thinking and problem solving is really important in the classroom and I don't think there is enough of it. There's design and technology, which has to have the technology in the design bit in order to make the government take it seriously. And then there is art. I'm not sure at all how seriously that is taken. I personally don't think the balance is right at my daughter's school but then again that might be just my own experience. The Internet of Things is interesting in this regard. The idea that small, everyday objects can have an IP address and communicate by Bluetooth or Wi-Fi is really interesting because it is the finest example of how I would teach coding, with coding in inverted commas. Take SAM LABS for example. SAM is an educational platform for children where you get these little bricks about the size of LEGO bricks but soft and rubberised and you squeeze them and then they appear on your desktop. So say I have a light sensor module and I squeeze that little brick and it comes up and says, light sensor, I then find a speaker module, squeeze that and it also appears on the screen. I now get my mouse or my finger if it's a touchscreen and draw a line between those two devices on screen, and if I now hold my hand over the light sensor module - therefore reducing the amount of ambient light going into the sensor - the speaker starts to make a noise. And the tone of speaker changes as I move my hand up and down. Now these are two blocks that are not plugged in by USB. They are linked by Bluetooth 4.0. There's no need for me to be asked to connect or put a passkey in, I literally just squeeze two objects and they become connected. That is a perfect example of what coding will be like in the future and it is this sort of technology that we should be investing in for our schools. Of course things get really interesting when you start layering up devices and introducing more advanced modules, such as the laser tripwire-operated Nerf gun sentry cannon that I made! I used SAM LABS and it took just an hour and a half! Coding wasn't necessary but creative thinking was. T3: Wrapping things up, would you like to venture some tech predictions for 2016? JB: Sure, let's do it. I'd say that PlayStation VR will be the stand-out VR solution, but HTC Vive will be the Apple of VR, in that is is a beautiful piece of product design and has a feature set that thus far is unrivalled. Also, I think that their could be a lot of technology introduced in the wellness and mindfulness space. I think the wearable market is going to dry up a little bit too, with its initial growth plateauing a bit. And, finally, I think we've only just seen the start of YouTube. YouTube has huge growth potential because of things like YouTube Red and YouTube 360-degree Video. T3: Thank you Jason, it's been a pleasure. The Gadget Show Live takes place from 31 March to 3 April 2016. For more information about the show, as well as to book tickets, please visit the expo's official website.